Beginning of this year sold our Indica and bought Swift-Dzire(ZDI) which we found very practical and perfect for our Indian need. And we did not thought of booking any new car in recent time. Suddenly things got changed when Pamela started a new job in May. We were quite happy with single car and personally opted for BIAS (Bangalore International Airport - Volvo) as I commute from Hebbal to Old Airport read every day around 20KM one way. Nano - Pros Price Cons - no power steering and many more as listed by others. Alto - Pros A complete car compared to Nano Cons Price difference almost 1.5 L to 1.8L different between different trims. Reva - Pros Alternative fuel Cons - Long running cost with Battery replacement, niche car in itself, Price is quite high 4.25L with AC model. After doing test drive on Nano & Alto Pamela said she is OK for Alto but for not for Nano (power steering). We dropped Reva along the path and did not did a test drive. But after 10 days of deliberation I had a test drove Nano. Definitely it is different compared all the cars I drove till date. Found I can manage it in city traffic for few days in a week. Plan to drive this when I know for sure I will be late; other sunny days can always take BIAS and have a worry free commute. Now why CX ??? -having AC in car was a must so the basic model was dropped. Found LX for another 30K is too much. As we would not be driving this car in extreme condition do not need fog lights and other features. With current 20K discount on road price for CX is just 2 lakhs which sounds right for me. Dealer promised to put sun film, mud guard and floor mats as complimentary. Might need to change the seats from vinyl to fabric after some time. The paper work was quite easy. Never bought a car like this before. The first car I bought in USA almost took 4 hours of marathon negotiation.But the delivery was a sad episode after 4weeks of wait finally got the Nano yesterday. The delivery dates from the dealer kept on slipping which was a shame and last Sunday we even given them cancellation request if they fail to deliver it early this week. On Monday they said they will deliver it. P.S. I drove the car for last two days, the ODO reads only 82KM for now. It is OK to drive but definitely does not feel like a complete car. 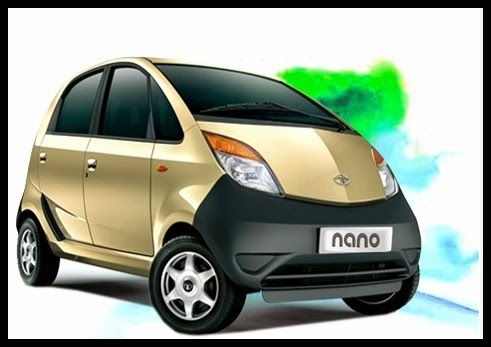 The picture is from Nano website the car comes without alloy wheels. During month of May there were some sudden turn of events happened that changed the course of my life as father. Well I am quite positive on this sudden turn of event that this happened for good. Pamela suddenly jackpot a teaching Job with one of the premier institute of Bangalore. And they asked her to join immediately. The first week was in training in Kormangala was OK OK as Aarush had his summer camp in his old school. They also have a day care so he got the adjusted to the same quite easily for the first week.Well end of the above paragraph does not qualify for a thought or blog post and does not happen in real life ? The ground reality was very different one but fun filled. The first week Pamela had to reach to her training by 8:30 and she is not yet comfortable in driving in Bangalore traffic. So opted for one temporary driver from an agency while we searched for a permanent one. That resulted in losing the luxury of car for me. Honestly that was boon and I am with BMTC Bus. The fun and difficult part was becoming a morning DAD for Aarush. Now I have to prepare him for school with shower and breakfast and etc. But to my delight Aarush has been very positive as he realised this new person is bit different from his beloved mother.We booked a 2 week vacation in end of May to visit my parental home. My younger brother will be coming from California and we will celebrate ‘rice ceremony’ for their son (Sheryaan). Now as Pamela can not go we cancelled our ticket at first thinking to cancel the trip. Now this is really a big event which we did not want to miss but it means Aarush have to come with me as he can not be left alone in Bangalore. With that I need to make fresh booking of Air ticket with some serious dent on my credit card ? I had to buy the same ticket 3-4 times costlier for myself and Aarush.I had to make Aarush aware of this upcoming BIG trip every day morning while preparing his for school. But the D-Day he was thinking it was more of me going on a trip then himself as the bag was not that big. But when we got down at Airport he was OK and we quickly moved through checking and security and boarded the flight. The flight was a late one starting at 21:00 from Bangalore and reaching Calcutta close to midnight. In the flight Aarush said he wanted to have some food which was a very positive thing as after having it he fall asleep. On reaching Calcutta we took a TAXI and reached a our hotel. A lot of strange eyes in Calcutta even one asked where is his mother ?? Well as it was very late Aarush slept easily. Next morning we had our flight to Siliguri at noon the postponement was informed to me in advance. So we left hotel late and had a leisurely brunch for Aarush and myself. At the airport Aarush opted for Idli (on of his favorite ) while I slipped a cup of coffee. He was very trilled with the ATR and it wings compared to yesterday’s jet. And more over it was a day flight where he could see lots of things. Reaching Siliguri and at home he was OK. He was a hero to many eyes. On the day of return he was very excited to go back to Bangalore and joining Pamela whom he missed for 4 days. The return flight was smooth – Aarush slept on the flight between Calcutta Bangalore and some paste on reaching Bangalore Airport. On 8th June he started his school with DPS. The first three days I need to go with him and on 13th on-wards he started going by the School Bus. The new routine is very demanding as Aarush have to get ready in 50 min to reach Bus-Stop within Godrej Campus by 07:30 AM. Every morning he suggests it is a holiday at school but once in Bus he is OK. It is already 2 weeks he is going by Bus and coming back to Day-care where he will have his lunch and nap and then Pamela picks him up while returning from School. So far so good with the new role but it is really demanding one for sure. We watched 'taare zameen par' one weekend though he loves the song 'Bum Bum Bole' the whole school system, punishment, separation from family made him sad he did not like the whole thing about Ishan. Looks like it was not a good idea to watch it with him. Started very early morning around 5.45 from our parking lot and with one stop at A2B restaurant at Krishnagiri reached Madurai exactly by 11.30AM. Then took some time to find out decent hotel two friends recommended “Royal Court” near Madurai railway station. The hotel is clean and neat the management was great to upgrade our room to executive suite as the original room smelt cigarettes. After settling we had a vegetarian south Indian lunch at market area. Then after taking a well deserved afternoon siesta we went to so called religious hotspot – Meenakshi Temple. It has four entrances we entered via South gate after leaving our shoes with the temple authorized shoe stand. The shops near the gates also offer to keep your shops but they expect you buy something from them in return. Best thing is the city municipality have golf carts to take you around to any of four gates your wish to enter. Like Tirupati they have fast track system where if you buy costly ticket and can bypass some queue. Santanu preferred to go by general path as crowd was not much. Within two hours we were done. 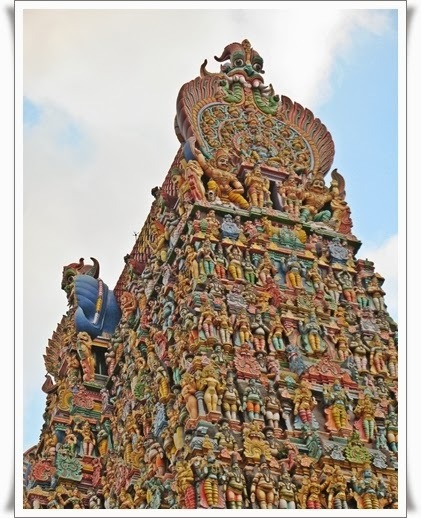 Would like you to go through more details of Meenakshi Temple this website is quite useful. The writer has well explained about temple interiors. By 7.30 PM we were done and were just about to return it rained heavily all of sudden almost stopping everything that whole street was full of water because of poor drainage. Being one way road it was bit difficult to walk of our own and we got into one cycle-rickshaw to go back to hotel. But the rickshaw driver had to stop as rain was too heavy; it brought a great relief from the humidity and heat. Had dinner around 9.00PM at hotel as Santanu got some food packed from a near by Anna Meenakshi Restaurant and then went to bed early. After finishing Belur-Halebid by 3.00PM we moved towards Chikmaglur as we wanted to reach our Apna-Sapna homestay before dusk. 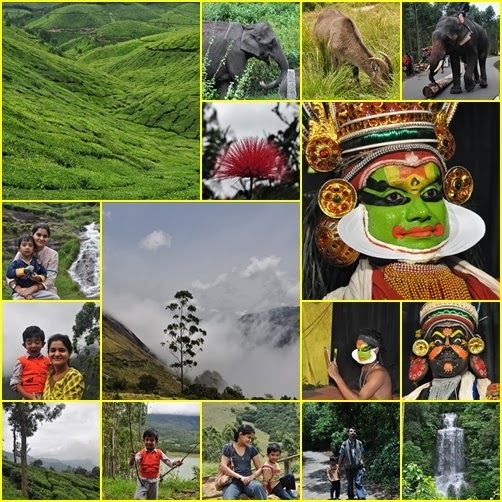 For God knows what reason here all homestay are highly priced based on per person per night. The Mountain section from Chikmaglur to Attigundi (village) was excellent and fun to drive on the twist and turn. The last part was a dirt road where we took diversion for our homestay a downhill road. Almost reaching there we saw three gates to enter three different coffee estates. Bit confused initially but then figured out by guessing. Best part here you don’t get any signal on your mobile other than BSNL (state owned provider). On reaching there we were given welcome drink and then showed our room by friendly staffs. It was not yet dusk and we freshened and sat in their dinning deck area to watch sunset. Mean while Aarush became friend with their in-house puppy. Although we were bit scared but he was fine with him. Valley in front of dining deck gave great view of sunset and sunrise. There was another couple other than us who came to celebrate their birthday. They were friendly we enjoyed their company that night. Aarush dozed off early evening unusual then other days as he had lots of activity for one afternoon. Next morning we woke up bit late and missed the sun rise but enjoyed morning serenity. Only thing we encountered here was butterflies and flock of birds chattering merrily. Around 10 we all got ready for their estate trip to go down in their 4X4 jeep. The first part of the estate trip was an introduction to different type’s coffee and their processing. We saw how it is dried under sun and tested the sweet coffee berries. 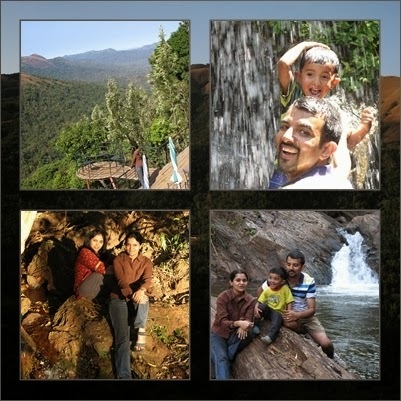 We went to a roaring water fall within the Estate, Aarush and Santanu had nice time under fall. There after we waited for a while for our lunch. In meanwhile we came to know that all estate managers who kept us in good company with small talks and jokes. With chitchat we all became so friendly that hardly we felt that few min. Before we were all strangers and how time went by…didn’t have any track of time. They even arranged a rifle shooting for other guest to celebrate his B’day. Late evening we were dropped to our rooms back then after relaxing we went for evening walk. We walked through other estate where we could hear the music of the cascades that dot this scenic landscape. And then finally found small stream of water gushing through their estates.Next morning around 10 we started for our return journey to Bangalore leisurely. On way back we paid 200 INR extra to traffic police for taking one way route at Chikmaglur town. This resort is more of a tone down motel rather than homestay as it is managed by people rather than owner directly. The food was average and cooked by a North Indian chef and nothing extra ordinary it taste just like any other common restaurant. That way a touch of local cuisine or a real host was missing. Standard of room were very basic. Only thing that was positive for us was since all estate owners were there (it was coffee picking season) we had nice time. And jeep trip and lunch at the bottom of their estate was free for us as we asked for it. It has been a long time that we ventured on NH-48; last time we visited Shravanabelagola in 2009. 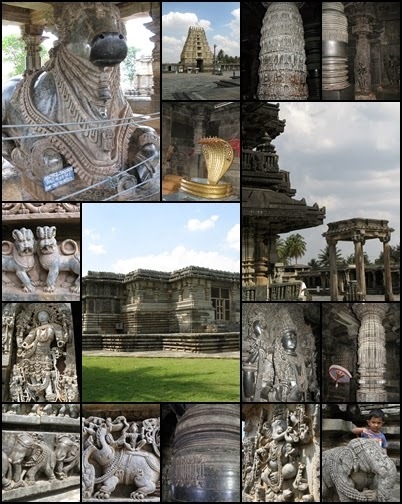 From then on it was always in discussion to visit Belur-Halebid known for its hoysala architecture. This time we covered both Belur-Halebid along with Chigmanglur on 3 day trip. We started at 7.10AM from our parking lot and reached Halebid by 12 with two breaks - breakfast at Hotel Mayura and at Hassan for ATM. Compared to 2009 road was far far better and journey was smooth. Still there are many parts where road work is going on and it is not yet divided 4 lane highway and around Kunigal there are some bad pot holes. On reaching Halebid we hired a guide for 200 INR which was in-fact must to know the details and history. The whole architecture is made of soap stone. He carried small mirror to reflect the sunlight in order to explain intricate details of temple. Halebid’s patron God is Shiva and the temple was built by the minister in honour of the King and the Queen. This is an incomplete construction where 3 generations of workers have worked but in many places you will notice ‘works in progress. It has suffered most damages amongst the three Somnathpura, Halebid and Belur. Today Helebedu in Kanada literally means ‘an old town’ to reflect its neglected past. It is unique with its two gigantic figures of Nandi (sacred bull) - One of them houses Vishnuvardhana Hoysaleshwara (King) and the other Shanthaleshwara (Queen). The bulls are decorated in distinct male and female ornaments to reflect whom they belong. The temple walls are covered with figures of men in battles, dancing women, Hindu deities, birds and animals. A stone platform is there at the centre of the hall where queen used to dance for the Lord Chennakeshava. Temple stands in the middle of a peaceful park by the side of a lake. Our guide enlightened us with an interesting tale that many sculptures were stolen and taken away by the British when they left India and those idols are now gracing homes in England and elsewhere. It takes at least two hours to take a round of the temple exteriors. There is so much to see in just one temple that we completely lost track of time here. Jain basadi is very near to Hoysaleswara temple which are equally rich in sculptural detail they are famous for its pillars, which are highly polished almost resembling mirrors. First is Parshwanatha basadi- this complex consists of three temples. Famous is the Parswanathaswamy Temple, which has a 14 ft high figure made of black stone. A seven-headed serpent has been imprinted on the head of this figure. Adinathaswamy (central mandir) and Shanthinathaswamy are the other two temples here. At road end there is Kedareshwara temple but there was no one except us visiting the temple. Though it shares same architectural elements with its neighbour it is a miniature of the former. From here we went to Belur at just 16 km apart it is a living town. Entrance to both the Hoysaleshwara temple and the Chennakeshava temple is free. The Chennakeshava Temple in Belur is dedicated to the Hindu god Vishnu and active worship still goes on in this temple while Halebid temple, though open to the public, is no longer in use for devotional purposes. Like the Hoysaleshwara Temple, the Chennakeshavatemple is star-shaped and stands on a platform. Elephants, episodes from the epics, sensuous dancers nothing was left without being carved. Forty-six pillars support the extensive hall, each of a different design. The Narasimha pillar is worth watching. The sculpted inner & outer walls of the temple tell a tale of dedication and sheer hard work by the craftsmen. Each figure is carved to perfection and straining to come to life any moment. The celestial beauties depict the lifestyles of that time showing dancers, shringar, feeding the pets etc. The walls of the star-shaped temple are literally covered with sculptures in stone that depict the various events in the epics of Ramayana and Mahabharata. The star design starts from the platform and goes all the way up the walls and up to the top of the shikhara. We skipped lunch in order to cover this area and can reach Chikmaglur before dusk. A day is enough to explore both sites if you think you are not too bored with sculptures. In Belur we didn’t hired guide which we regret later. P.S. As mentioned by Mr.Bhat the worship continues in Halebid temple. This year we didn't celebrate Aarush B'day as we moved to our own apartment. Being new to complex we hardly knew anyone to invite.So decided to celebrate his B'day at school which he of-course didn't like much as he didn't receive any gifts and top of it he has to give return gifts to his school mates….which he did so with heavy heart. We decided to take him to Dubare elephant camp. We booked for jungle lodges...although bit pricey but worth every penny of it. Everything is done on time and there are naturalist for every activities as mentioned on their web site. 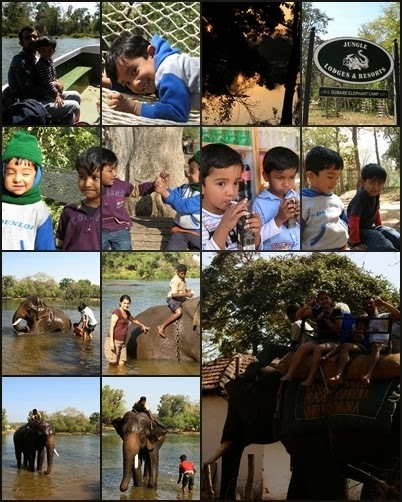 No doubt, Jungle Lodge rocks as they pamper with their services and hospitality. It was unexpectedly cold in the night for which we were not that well equipped but rest all was too good. Aarush enjoyed and made frienship with Mehul ; he had good time there. We did spotted some deers and small wild animals and the documentary on Indian Tiger on th evening was too good. One thing I would like to add is that as said that visitor can give bath to elephants ; its definatley something to experience but elephants do potty as they get into water so it was bit unygenic feeling which didn’t allow me to give them bath with same enthu. Last day at Jaipur, today we have kept ourselves more or less free for shopping. Had breakfast at hotel lawn for the first time. The buffet breakfast at Hotel Madhuvan worth only when you have time to enjoy it. We met one Indian family who were travelling from Gujrat for the Diwali weekend to Jaipur and wanted to join us at Chokhi Dhani later in the evening. Around 10 we left for shopping with Mr. Singh. Many shops were closed on account of after Diwali mood but still we managed to hop from one shop to another - Rajasthali, blue pottery shop etc. Then we tried the famous Ram Chandra Kulfi (Indian Ice Cream) in Tripolia Bazaar on way back to hotel for a siesta and left for Sanganer & Chokhi- Dhani around 5ish. We took Jaipur-Tonk Highway and did more shopping at Sanganer famous for its block printing, screen printers, blue pottery and hand made papers. According to Mr. Singh many store/small factories do not let Indian inside as these stuffs are bit expensive for common Indian and mostly for export. 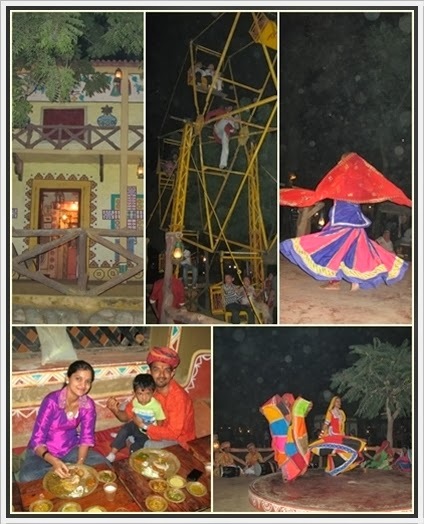 Choki Dhani basically gives picture of rural life of Rajasthan a miniature theme park. Bit expensive but worth going for the dinner alone. This resort is divided into two sections, one for daily visitors while the other for overnight stays. The first section charges an entrance (350 INR) fee that includes authentic veg Rajasthani dinner with traditional floor seating arrangement and allows the visitors to enjoy traditional rural activities such as tightrope walkers, camel cart rides for minimal fees. There is also an A/C section for food which charges around 700 INR. Ram Ram Sa!!! Was first thing to hear. First we had dinner there which was wise decision as crowd was getting thicker with time. According to the ticket schedule our dinner time was 10 PM; but as it was around 8 there not much crowd and we got a seat quite easily. The elaborate Rajasthani thali have many varieties of Chapaties (bread) and vegetables which is served until you ask them to stop. Next morning had flight back to Banglore in the morning. A bientot!!!! The first thing that struck me about Rajasthan was its roads when I last went in 2000 with my parents. Rajasthan roads are amazing; and they are very well connected interms of bus, train, private cars, even one can hire cars to drive around between different places with in state. This makes travelling in Rajasthan quite safe and less tiring. With good road conditions you can also explore the interiors of Rajasthan. This fact remains same even today when I visited with my family on oct. 2010. The time from Oct to December is considered ideal to visit Rajasthan, though its high tourist season. One major drawback is they will make feel Indian tourists discriminated infront of westners as they get Tips in foreign currency. Rajasthan is full of great eating out options from the regular highway dhabas to the most luxurious hotels in India. They have very rich culture interms of dress colour, turbans- they have more than 1000 types and styles of doing the turban, the variations depending on the region, casteand creed in the society. An array of instruments such as sarangi, ektara, dhol, chang etc are used to create melodious tunes as well as variations in folk dances. Camel safari is “must do” depends if across Thar then its a great way to explore the vastness of the desert. Once you like the culture you feel like pluging deeper and getting mesmerised. Being one of the tourist hub it is highly commercialized in almost every aspect of its existence. There are many remote areas mostly nomadic villages, where entertaining the tourists is the only form of livelihood that can be thought of. Also, all tourist attractions charge for photography and videography which is worth but surprising thing is difference in prices for foreigner and indian tourist. Another thing which I like about this place is they know business very well. If you go for shopping and think that certain thing may have to pay extra at airport then ofcourse you can opt for their courier service which they will do for free. But be aware, certain times complain are there that they send defective piece or change the fabric which you have opted for after it's INDIA where everything can happen. Santanu is so impressed that he wants to travel again to Rajasthan but with different route probably - Bikaner, Mt.Abu ,Udaipur, Chittorgarh,Kota,Bundi, Ranthambore, Agra back to Jaipur. One thing I would like to add here is with no. of days we have spent there we could have easily covered Bikaner. Early morning reached Jaipur from Jaisalmer by train. This time our cab driver from hotel (Madhuban) was waiting and on reaching hotel relaxed for while. Before leaving for Jodhpur, we have fixed with Mr. Singh (our reliable cab driver) for this trip to Ajmer-Pushkar. As usual, he was there on time; left hotel room around 8.00am. Had our breakfast on way at small neat and clean dhaba. Road being 6 lane; had very comfort drive and was hardly crowded. We went first to Kishangarh fort, with Phool Mahal Palace, a heritage hotel along side and Gundalao Lake on the front. This heritage hotel was previously the residence of the Maharajas of Kishangarh. Major part of lake bed is now converted into verdant fields. Area is quite famous for miniature paintings. But being holiday we could not visit any art gallery. Took few snaps and headed towards our next destination. Soniji Ki Nasiyan at Ajmer is a Digambar Jain temple. The main chamber, known as the Swarna Nagari (City of Gold), has several gold-plated wooden figures, depicting characters in the Jain tradition. The main prayer hall is a separate complex. From there went to Dargah Sharif of Khwaja Moinuddin Chisti. Being a Diwali day and Friday it was overly crowded. We had to leave camera and shoes outside with a flower stall and head covering was mandatory. After paying our obeisance we asked for the way to Adhai Din Ka Jhopda, a Vaishnav Hindu temple constructed in 1153 and later converted into a mosque by Qutubudin Aybak in 1193. We went there by walk through a small lanes which are full of small eateries and sweet shops. If you are hygiene freak you might want to skip this part of Ajmer. Mr. Singh took us to Anasagar Lake, man-made lake to relax and to take a break. It was really refreshing and helped us in gaining our breath break after all those pushing and Ochlophobia in-around Dargah. 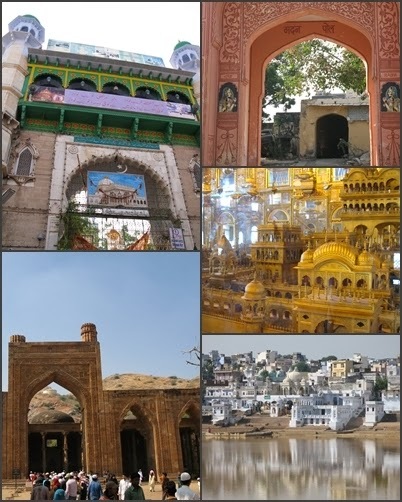 Ajmer and Pushkar are two side of common mountain range and distance between them is only 15 KM. We first went to Brahma (the creator of the universe) temple at Pushkar. The best irony of Hindu mythology is Lord brahma is only worshiped in Pushkar in the whole universe as he was cursed by his 1st wife. Two temples of his two wives are at the top of two separate mountain tops and in between is his temple next to Pushkar lake.Unlike dargah, there was hardly any crowd here. Finally, went to Pushkar lake where all the house next to lake are painted in blue to symbolize the Brahmin owner. Just opposite to lake there is one resto where we had scrumptious Pasta (which was awesome) as lunch. On way back went to see Chota Pushkar nearby and by early evening we were at Jaipur city to celebrate Diwali. Took a walk on residential area nearby our hotel and had dinner thereafter.This was Aarush's first hand experience of Diwali in North India where sounds from crackers are louder compared to South.